A M P Brickwork Ltd has been trading for 5 years and during this time we have taken on various jobs in the brickwork and groundworks areas such as garden walls, patios, block paving, re-pointing. Recently we have been carrying out insulations of fake grass lawns and resin bonding compound floors. 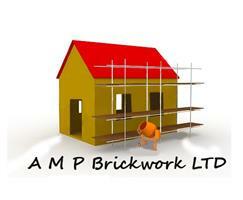 I have worked in the construction industry for over 25 years gaining and honing a wide variety of skills. I work to a mantra of completing a job right first time and don't look at the problems but at the solutions. All types of works Domestic and Commercial .... we carry out are re-pointing, brickwork, block paving, slabbing, steps, fencing, gutterclearance/replacement,etc.